Have you ever wondered, “What does my child’s behaviour have to do with their sensory systems?” I’ve been there, feeling like pulling my hair out because of these seemingly strange behaviours my child has. 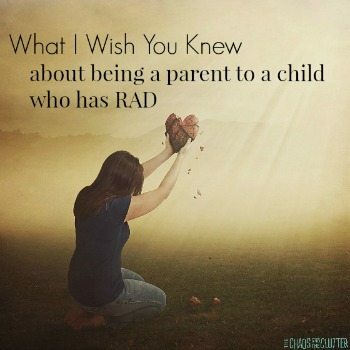 My introduction into the world of Sensory Processing Disorder (though at the time it was called Sensory Integration Disorder) came thanks to our oldest daughter, Miss Optimism. Miss Optimism was what people referred to as a busy child, always moving and often getting into mischief. She would spin around and around and around and never seemed to get dizzy. She would strip off her clothes in winter to put on a bathing suit just as we were about to walk out to door to get groceries. When we finally did get out the door to go shopping, she would reach out and touch everything on the shelves and even sometimes touch people as we walked past. 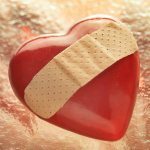 She had a freakishly high pain tolerance and it would sometimes lead to injury as she also seemed to have no concept of danger. She broke things by accident because she wasn’t aware of her own strength. One of the many things she broke was the necklace I had worn at my wedding. She would have meltdowns for what seemed to be no reason. She pulled down all the decorations in her room and started to pick holes in her walls. She was the pickiest eater I had ever met. She didn’t seem to have any attention span and would flit from one activity to another, leaving a huge mess behind her everywhere she went. She preferred to be upside down to being right side up. And upside down is how I was starting to feel my life was while I tried to figure out how to parent her! 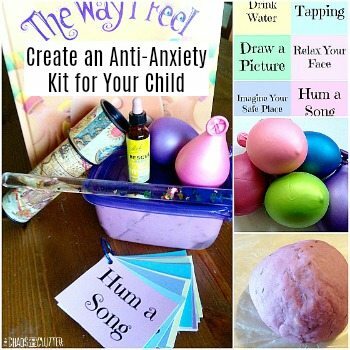 It wasn’t until I got a phone call from her preschool teacher asking me what her diagnosis was that I realized that these things were not typical behaviour for a child her age. That began my entry into the world of Sensory Processing Disorder. We began working with an OT. In using her suggestions and adjusting things in our home, the changes in our daughter were significant and immediate. 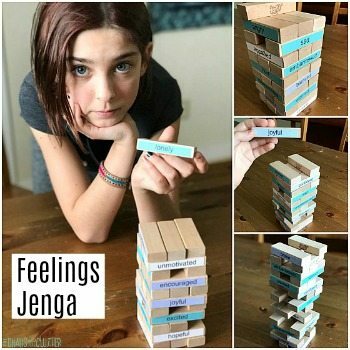 The more I learned about sensory, the more I was able to recognize that her challenging behaviours were actually sensory responses. I could then give her strategies to help her cope. And in making changes in her environment, she was able to find moments of calm and learn how to better express her needs. One of the first steps in making adjustments in your home and in your expectations is to better understand what behaviours are related to sensory needs. It is important to also understand which sensory system those needs relate to. 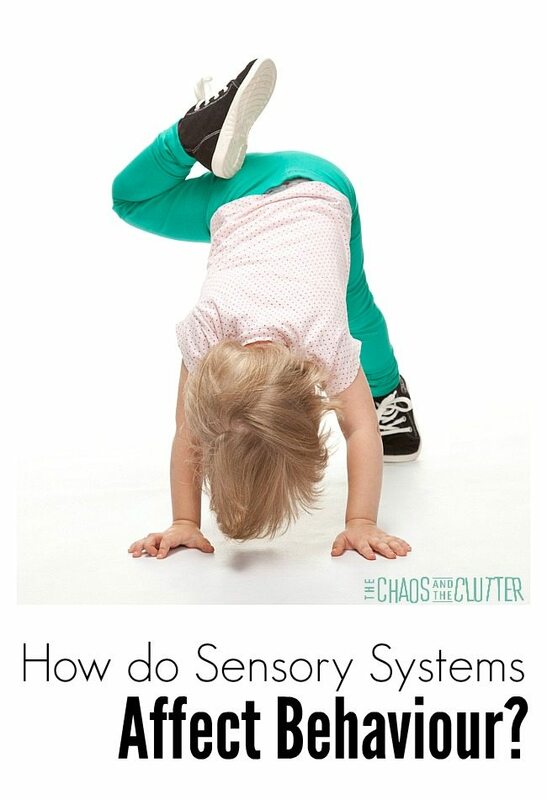 If you understand which sensory system is at play, you can implement sensory solutions specific to that sensory system in order to target it and reduce “behaviours”. I find that it is helpful to think of behaviours that result from sensory needs as side effects instead of purposeful behaviours. They are simply a side effect of our child getting too much or too little of the “medicine” (sensory input of that sensory system). When we determine what our child is getting too little or too much of, we can adjust the dosage accordingly. These are just a sample of examples to help you determine your child’s sensory needs. Each sensory system has other “side effects” as well but these should give you a good idea of what to look for. As you can see from this list and the behaviours I described in my daughter, it is possible and in fact probable that a child can show seeking behaviours for some things and avoidance behaviours for others. You will also see that some behaviours like chewing on clothing can be representative of more than one sensory system, so you will have to do some detective work to discover which system is at play and how to meet those sensory needs. 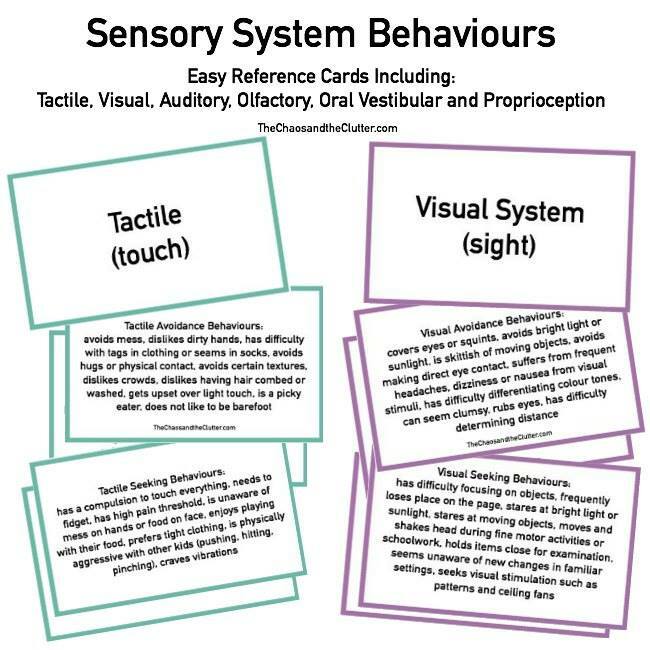 To get your free Sensory System Behaviours Easy Reference Cards and be included in a 5 part email series Sensory Solutions and Activities, simply sign up here.